Role of Neo1 on human PMN apoptosis and MΦ efferocytosis. 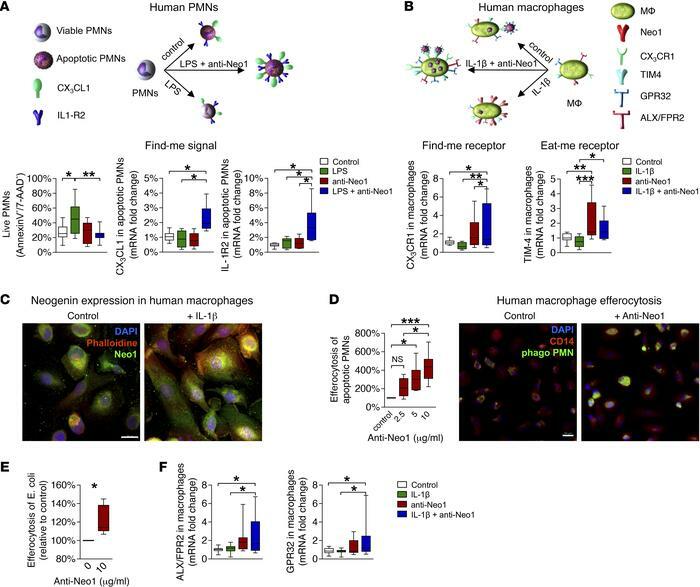 (A) Apoptosis of human PMNs following LPS and/or anti-Neo1 stimulation was determined by flow cytometry and the expression of CX3CL1 mRNA and IL-1R2 mRNA was evaluated by RT-PCR. (B) Human MΦ were stimulated with IL-1β and/or anti-Neo1 antibody and the CX3CR1 mRNA and TIM4 mRNA levels were determined by RT-PCR. (C) Neo1 protein expression was assessed by immunofluorescence staining (n = 3/condition, magnification ×630, scale bar 20 μm). (D) The dose-dependent impact of anti-Neo1 treatment on MΦ clearance of the apoptotic PMNs and the corresponding immunofluorescence images (n = 3/condition, magnification ×400, scale bar 20 μm). (E) MΦ efferocytosis of E. coli. (F) mRNA expression of the ALX/FPR2 and GPR32 receptors in human MΦ. Results represent 2 independent experiments and are expressed as median ± 95% CI (n = 6–8 per group). Statistical analysis was done by ANOVA followed by Bonferroni’s post hoc test, *P < 0.05, **P < 0.01, ***P < 0.001.